Joseph Michael Nathan (born November 22, 1974) is an American former professional baseball pitcher. He played 16 seasons in Major League Baseball for the San Francisco Giants, Minnesota Twins, Texas Rangers, Detroit Tigers, and Chicago Cubs. Nathan started out his baseball career as a shortstop in high school and at Stony Brook University, but converted to a pitcher after being drafted by the San Francisco Giants. He worked his way through the minor leagues, alternating between spots in the rotation and the bullpen. After a few years of splitting time between the majors and the minors, Nathan had a breakout season as a setup man for the Giants in 2003. That offseason, Nathan was traded to the Minnesota Twins and became their closer. From 2004 to 2009, Nathan was considered one of the top closers in Major League Baseball (MLB) with four All-Star appearances and a league-leading 246 saves. In 2010, Nathan underwent Tommy John surgery to repair a torn ulnar collateral ligament in his throwing elbow and missed the entire season. On April 3, 2011, Nathan recorded his first save since his injury against the Toronto Blue Jays and later that year in July, Nathan regained the role as closer. On August 10, 2011, he became the Twins all-time leader in saves with his 255th in a game against the Boston Red Sox. After the 2011 season, Nathan left the Twins via free agency to sign with the Texas Rangers, becoming an All-Star again in 2012 and 2013. On April 8, 2013, he earned his 300th save. After the 2013 season, Nathan left the Rangers via free agency to sign with the Detroit Tigers. Nathan retired during the 2017 season and is currently eighth on the all-time saves list. Nathan currently has the highest save percentage in MLB history amongst pitchers with at least 250 saves. Nathan graduated from Pine Bush High School in Pine Bush, New York in 1992, where he played basketball and baseball and ran track. Only Division III colleges showed minimal interest in him, and he ended up at Stony Brook University largely because his high school assistant coach Jeff Masionet and Stony Brook baseball coach Matt Senk knew each other as former teammates in the State University of New York at Cortland baseball program. Nathan first played shortstop for the then Division III Stony Brook Patriots (now Division I and called the Seawolves), at Stony Brook University on Long Island, New York. He also played for the Fairfield Stallions in the New England Collegiate Baseball League in 1994. Nathan became a two-time Academic All-American and graduated as a member of the Golden Key International Honour Society. During his tenure at Stony Brook, professional baseball scouts began to notice his good arm and pitcher's body. Senk arranged for a game in front of scouts, but on a day that "literally someone from every organization" came to watch him pitch, the game was rained out. The scouts had to settle for watching Nathan in a throwing session. He was drafted in the sixth round (159th overall) of the amateur draft by the San Francisco Giants in 1995, and signed the next day, June 2. In 2006, Nathan's number 22 was retired by Stony Brook, the first athlete to receive that honor from the school, and he was awarded the University Medal, the highest recognition given by Stony Brook. In August 2008, he gave the Stony Brook athletics department $500,000 for a new baseball facility. In recognition of this "lead gift" from the Joe Nathan Charitable Foundation, the college named their baseball stadium Joe Nathan Field. He began his minor league career in Class A for the Bellingham Giants. After an unsuccessful year at the plate the Giants tried to convert Nathan into a pitcher, but he refused and left to return to Stony Brook for a year, graduating with a degree in business management. He gave more thought to his future in baseball, however, and after graduation decided to return to the Giants organization and developed into a standout pitching prospect. After a season with the Salem-Keizer Volcanoes, he pitched for both the A and AA levels for (the San Jose Giants and Shreveport Captains) in 1998 as a starter. During his tenure with San Jose he started 22 games with an ERA of 3.32 and 118 strikeouts, leading the Class A Giants to the California League championship. Promoted to AA Shreveport in 1999, he pitched in only two games before being promoted to the parent club in 1999. Nathan was promoted to the San Francisco Giants on April 20, 1999, taking the roster spot of superstar slugger Barry Bonds, who went on the disabled list after left elbow surgery. He made his major league debut the next day, pitching seven shutout innings and winning his first major league decision against the Florida Marlins, 4–0. He then divided the rest of the season between the AAA Fresno Grizzlies and the Giants, going 6–4 with the Griz and 7–4 and 4.18 with the Giants, earning his first career save on May 16 against the Houston Astros. After a short stint in the minors in 2000, Nathan spent most of the season in the majors, finishing 5–2 and even hitting two home runs. But he struggled with his control, walking 63 in 93​1⁄3 innings and ending the season with a 5.21 ERA. He was on the disabled list twice: from May 17 to June 6 for right shoulder tendinitis and from July 14 to August 18 for an inflamed right shoulder, necessitating arthroscopic surgery on the afflicted shoulder at the end of the season. Nathan divided 2001 between the AAA Fresno Grizzlies and AA Shreveport both starting and relieving, finishing with a disappointing combined 3–11 record and an ERA over 7. Nathan improved slightly in 2002 to 6–12 with an ERA of over 5 at Fresno, but finally overcame his postsurgical struggles to return to the Giants in September with 3​2⁄3 scoreless innings in relief. Nathan spent all of 2003 with the Giants in the bullpen after marrying Lisa Lemoncelli, his girlfriend of five years, in November 2002. This was a breakout year for Nathan, starting the season with 23 scoreless innings en route to a 12–4 record in his first full year as a reliever. His 78 appearances put him high on the list of most-used pitchers for the season as one of the best setup men in the NL, allowing no runs in 15 appearances from July 18 to August 20. His 12 wins in relief led the majors. The Giants won the National League West by 15​1⁄2 games and drew the Florida Marlins, the National League's wild card winner, in the NLDS. Nathan was hit hard in that series, blowing his only save opportunity. His team fared no better, winning Game 1 behind Jason Schmidt's complete game shutout before dropping the next three. Nathan was traded to the Minnesota Twins on November 16, 2003. The Giants sent Nathan to the Twins along with pitchers Boof Bonser and Francisco Liriano for catcher A. J. Pierzynski and cash. The Twins decided to make Nathan their closer starting in 2004, risky move considering that Nathan had notched only one save in six opportunities as a Giant, but he won the job over J. C. Romero and Jesse Crain in spring training. He was signed to a three-year deal on March 4, 2004 and agreed to an incentive-laden contract with a base salary of $440,000. He started off the season strong, allowing no runs in 20 appearances and earning 14 saves from April 15 to June 4. He was named AL Co-Player of the Week starting on May 10 with four saves in four innings and four appearances, facing the minimum number of batters each time. His credentials for the first half of the season, 23 saves in 24 opportunities with a 1.19 ERA in 26 appearances, earned him his first All-Star appearance in the 2004 MLB All-Star Game. He was the only Twin on the squad and pitched a perfect seventh inning, getting Bobby Abreu to strike out, Mike Lowell to fly out and Miguel Cabrera to strike out. His numbers were impressive through the rest of the season, allowing no runs between June 9 and August 18, and between August 25 and September 16. and finishing 2004 with 44 saves in 47 opportunities and an ERA of 1.62. The Twins won the AL Central division and faced the New York Yankees in the ALDS. Nathan picked up his first postseason save in Game 1, but blew his second opportunity in Game 2 as the Twins went on to lose the ensuing three games. His outstanding season earned him MVP and Cy Young votes, finishing fourth for Cy Young and 12th for MVP. His first child, a son named Cole, was born on November 9, 2004. During spring training in 2005, Nathan signed a two-year deal that includes a club option for 2008. He picked up from where he left off in 2004, allowing no earned runs in 15 appearances from April 5 to May 10. He also had streaks of 13 and 12 consecutive save opportunities converted between April and July. As a result, Nathan was named the American League Player of the Week for the week of June 27. Nathan earned another All-Star appearance in 2005 for his pitching in the first half of the season. Although his record was 1–3 with a 3.57 ERA in 37 appearances, he had struck out 43 batters in 35​1⁄3 innings pitched, and lead the AL with 23 saves in 25 opportunities. Nathan pitched in the 2005 MLB All-Star Game alongside fellow pitcher Johan Santana. Pitching the eighth inning of the game, he got Morgan Ensberg to pop out for the first out, then gave out a double to Moisés Alou. Felipe López singled, and Nathan was able to get Miguel Cabrera and Luis Castillo out, but not before Alou scored. Nathan had a brilliant second half as he went 6–1 with 18 saves in 20 chances, and posted an ERA of 1.76. He finished the season with a 7–4 record, a 2.70 ERA, 43 saves in 48 opportunities, and 94 strikeouts. Nathan also became the third pitcher in club history to post consecutive 40 save seasons. The Twins however missed the playoffs. Before the 2006 season began, Nathan participated in the 2006 World Baseball Classic as one of the 30 players selected for the Team USA roster. He played the first game, a 2–0 win against Mexico, striking out the side while allowing one hit. He also pitched the 4–3 victory against Japan, again throwing a shutout inning. Nathan went on to pitch the last game for the United States in the ninth inning against Mexico, again not allowing a run and striking out two. As the regular 2006 season began for the Twins, Nathan started off strong, allowing no runs from the start of the season to April 25. He also converted 10 straight save opportunities from April 11 to June 17. On June 24, Nathan recorded his one hundredth career save against the Chicago Cubs, and 99th save with Minnesota. Four days later he got save number 101, his hundredth save with Minnesota against the Los Angeles Dodgers, becoming the fifth pitcher in Twins history to achieve that mark. Despite putting up great numbers during the 2006 season, Nathan was not selected to the All-Star Game. He continued to pitch well throughout the season, passing Eddie Guardado for second on the Twins' all-time save list when he earned his 117th save against the Detroit Tigers on September 9. Nathan was also given the Major League Baseball Delivery Man of the Month award for July, going nine for nine in save opportunities and posting a 0.75 ERA for the month. He finished the season with some of his best numbers to date: a 7–0 record, a 1.58 ERA, 95 strikeouts, 36 saves, an 18th-place finish in MVP voting, and a fifth-place finish in Cy Young voting. His 61 games finished were also good for the AL lead and opponents batted just .158 against him, a career high. With 36 saves in 38 opportunities, Nathan also became the first pitcher for the organization to earn 35 saves in three straight seasons. The Twins won the division on the last day of the regular season, but were swept by the Oakland Athletics in the ALDS as Nathan made one scoreless appearance. Nathan continued as the Twins' closer for the 2007 season. He had a stretch between July and August where he gave up just two earned runs and converted all 12 save chances. Once again despite Nathan's numbers, he was not picked for the All-Star team. Nathan finished the year by converting 37 of 41 save opportunities with a record of 4–2 and an ERA of 1.88. The Twins, however, had a disappointing season and missed the playoffs. On September 25, 2007, Nathan was named as one of 10 finalists for the "DHL Delivery Man of the Year Award", the third year in a row that he has been a finalist. On October 29, the Twins exercised Nathan's club option for 2008. Nathan started the season with 13 consecutive saves but blew his first save of the season on May 27 by giving up a three-run inside-the-park home run on a misplayed fly ball by teammate Delmon Young; however, Nathan got two outs to end the 9th inning and the Twins went on to win the game. By converting 27 of 29 save opportunities prior to the All-Star break, Nathan was selected as a reserve player for the American League in the 2008 Major League Baseball All-Star Game. Nathan finished the year with 39 saves and a career best 1.33 ERA. He also had a career high six blown saves and surrendered his first career walk-off home run to Victor Martinez on September 16. Nathan ranked seventh in the majors in saves and had the lowest ERA of the top 30 save leaders in 2008. Nathan had a strong season, as he was selected as an All-Star for the 2009 MLB All Star Game, and he finished the year with 2.10 ERA with 47 saves in 52 opportunities, which was a franchise record. He shared honors for the AL Rolaids Relief Man award with Mariano Rivera. However, Nathan did not fare as well in the postseason; in Game 2 of the American League Division Series against the New York Yankees, with the Twins leading 3–1 in the bottom of the ninth inning, Nathan blew the save when he surrendered a game-tying two-run home run to Alex Rodriguez. It was the first home run Nathan had allowed with men on base all year. The Yankees later won the game in the 11th inning and swept the series. On October 11, 2009, after the Twins lost the final game at the Metrodome (a 4–1 playoff loss to the Yankees that eliminated them), Nathan took a pile of dirt from the mound as a keepsake from the Metrodome. On March 9, 2010, it was reported that Nathan had a tear in his ulnar collateral ligament. On March 21, after attempting to pitch without having surgery, Nathan decided to undergo Tommy John surgery, missing the entire 2010 season. Nathan earned his first save at Target Field on April 8, 2011. He emptied the container of dirt he took from the Metrodome on the mound at Target Field before pitching. On April 18, Nathan was replaced at closer by Matt Capps after going 3 for 5 in save opportunities. On May 28, 2011, Nathan was placed on the 15-day disabled list with a right flexor muscle strain. Chuck James was called up to take his place. On August 10, 2011, against the Boston Red Sox, Nathan became the Twins all-time saves leader with 255, passing Rick Aguilera. After the Twins declined his $12.5 million club option and exercised a $2 million buyout, Nathan became a free agent at the end of the 2011 season. Nathan is currently the Minnesota Twins leader in career saves, with 260. On November 21, 2011, Nathan agreed to terms on a two-year deal with the Texas Rangers worth $14.5 million guaranteed with an option for a third year at $9 million or a $500,000 buyout. Nathan had a strong first season with the Rangers, as he was selected to the represent the Rangers at the 2012 MLB All Star Game, the fifth all star selection of his career. He finished his 2012 campaign with 37 saves and an ERA of 2.80. During a game against the Tampa Bay Rays on April 8, 2013, Nathan earned his 300th career save after striking out Ben Zobrist looking on a controversial strike call made by home plate umpire Marty Foster. TV cameras captured Nathan saying "Wow!" after the call. Nathan was selected to his sixth All Star Game in 2013, and earned the save for the American League. Nathan improved on his 2012 campaign, finishing his 2013 season with 43 saves and an ERA of 1.39. Nathan finished his Rangers career with an overall record of 9–7, 80 saves, a 2.08 ERA and 0.98 WHIP. On December 4, 2013, the Tigers signed Nathan to a two-year, $20 million contract, with a club option for 2016. This reunited him with former teammate and fellow ex-Twins great, Torii Hunter along with Rangers teammate Ian Kinsler. On May 5, 2014, Nathan recorded his 347th career save, tying him with Randy Myers for ninth on the all-time saves list. Two days later, Nathan recorded career save number 348, putting him alone at ninth on the all-time saves list. On June 9, Nathan recorded career save 358, tying him with Troy Percival for 8th on the all-time saves list. On August 23, 2014, Nathan recorded his 368th career save, passing up Jeff Reardon for 7th place on the all-time saves list. In a September 16 game against the Minnesota Twins, Nathan blew his seventh save of the season, surpassing his previous career high of six blown saves when he pitched for the Twins in 2008. Nathan finished his first season with the Tigers making 62 appearances and recording 35 saves in 42 chances, while posting an ERA of 4.81. He made one postseason appearance in 2014, retiring all three batters he faced in a non-save situation in Game 2 of the ALDS against the Baltimore Orioles. The Tigers were swept in the series, 3–0. On April 8, 2015, Nathan was placed on the 15-day disabled list due to a strained right elbow. During a rehab start with the Toledo Mud Hens on April 22, Nathan re-injured his elbow after throwing only 10 pitches. The same night, Nathan underwent MRIs, which tested positive revealing tears in his ulnar collateral ligament of the elbow and his pronator teres muscle, and would undergo Tommy John surgery, ending Nathan's 2015 season. Sources projected that this surgery could end Nathan's career, but he was not planning to retire yet. During the 2015 offseason, the Tigers declined the $10 million club option for Nathan for the 2016 season, and exercised a $1 million buyout. On May 17, 2016, Nathan signed with the Chicago Cubs. He was immediately placed on the 60-day disabled list upon signing to continue recovery from his previous Tommy John surgery. He made his Cubs debut on July 24, 2016 against the Milwaukee Brewers, pitching one inning and striking out the side while allowing one hit and one walk. After three appearances, the Cubs designated Nathan for assignment on August 6, 2016. The Cubs went on to win the World Series that year, earning Nathan his first World Series ring. On August 16, 2016, Nathan signed a minor league deal with the San Francisco Giants. On September 3, Nathan was called up from the Richmond Flying Squirrels to the Giants expanded September roster. Nathan signed a minor league contract with an invitation to spring training with the Washington Nationals for the 2017 season. He opted out of his contract and was released on March 27, 2017, as spring training came to a close. He was re-signed to a minor league contract on April 10, and released for a second time on May 31. On September 3, 2017, Nathan held a press conference with the Minnesota Twins, where he announced his retirement after signing a one-day contract to end his career in Minnesota. Nathan threw out the first pitch during that night's game against the Kansas City Royals. Nathan retired with 377 saves, at the time eighth-most in MLB history, a 2.87 ERA, and an 89.3% save percentage, the highest amongst all relievers with at least 250 saves. He and his ex-wife have two children. Nathan's foundation, Joe Nathan Charitable Foundation, also called "Save It", helps raise money and awareness for many different charities. Nathan threw a mix of four pitches. His main pitch, a four-seam fastball was once thrown in the mid-to-upper 90s, but settled between 91 and 94 mph. His main breaking ball was a hard slider in the upper 80s, occasionally even touching 90. He used the slider less frequently against left-handed hitters, preferring to use a curveball in the low 80s. He also used a two-seam fastball against lefties. His slider was his best swing-and-miss pitch, with a whiff rate of 42% since 2007. ^ Cliff Corcoran (May 5, 2009). "Closer rankings, from No. 1 to 30". SI.com. Retrieved August 24, 2009. ^ Thesier, Kelly (March 26, 2010). "Nathan undergoes Tommy John surgery". MLB.com. Retrieved May 19, 2014. ^ a b c "Joe Nathan Player Information : Biography and Career Highlights". Archived from the original on December 7, 2007. Retrieved August 21, 2007. ^ "Joe Nathan: Face of the Twins". Archived from the original on October 26, 2006. Retrieved August 21, 2007. ^ a b c d Simon, Mark (May 12, 2005). "Beyond Tonight – Joe Nathan". ESPN.com. Archived from the original on March 11, 2007. Retrieved May 19, 2014. ^ a b "Stony Brook University Council". Stony Brook University. December 5, 2006. Retrieved May 19, 2014. ^ a b c d e f g h i j "Joe Nathan Statistics". Sports Reference LLC. Retrieved August 21, 2007. ^ Baumbach, Jim (June 21, 2007). "Nathan, Stony Brook benefited from each other". Newsday. Archived from the original on July 1, 2007. Retrieved August 21, 2007. ^ "Stony Brook University Announces Lead Gift from Major League Baseball All-Star And SBU Alumnus, Joe Nathan". Stony Brook University. August 11, 2008. Archived from the original on August 18, 2008. Retrieved May 19, 2014. ^ a b c d e f "Joe Nathan Baseball Statistics". The Baseball Cube. Archived from the original on December 9, 2010. Retrieved May 19, 2014. ^ "Conversation with Joe Nathan". Subway Chatter. Archived from the original on July 16, 2011. Retrieved August 25, 2009. ^ a b "San Jose Giants baseball club". Archived from the original on November 2, 2006. Retrieved August 21, 2007. ^ "Official site of the Minnesota Twins: 1999 Career Highlights". Archived from the original on December 7, 2007. Retrieved August 21, 2007. ^ "Official site of the Minnesota Twins: 2000 Career Highlights". Archived from the original on December 7, 2007. Retrieved August 21, 2007. ^ Schulman, Henry (April 4, 2003). "No ordinary effort from this Joe". The San Francisco Chronicle. Retrieved May 19, 2014. ^ "Official site of the Minnesota Twins : 2003 Career Highlights". Archived from the original on December 7, 2007. Retrieved August 21, 2007. ^ a b c "Official site of the Minnesota Twins : 2004 Career Highlights". Archived from the original on December 7, 2007. Retrieved August 21, 2007. ^ Browne, Ian (July 14, 2004). "Nathan dazzles NL hitters". MLB.com. Archived from the original on March 21, 2008. Retrieved May 19, 2014. ^ a b "Twins exercise Nathan's option at bargain price of $6M". ESPN.com. Associated Press. October 29, 2007. Retrieved February 26, 2009. ^ a b c d "Official site of the Minnesota Twins : 2005 Career Highlights". Archived from the original on December 7, 2007. Retrieved August 23, 2007. ^ "World Baseball Classic: Statistics, Mexico-U.S." Archived from the original on July 23, 2012. Retrieved August 23, 2007. ^ "World Baseball Classic: Statistics, Japan-U.S." Archived from the original on July 19, 2012. Retrieved August 23, 2007. ^ "World Baseball Classic: Statistics, U.S.-Mexico". Archived from the original on February 16, 2012. Retrieved August 23, 2007. ^ a b c d e f "Official site of the Minnesota Twins : 2006 Career Highlights". Archived from the original on December 7, 2007. Retrieved August 23, 2007. ^ "Press Release: Joe Nathan named winner of the "DHL Presents the Major League Baseball Delivery Man of the Month Award" for July". MLB.com. August 7, 2006. Retrieved May 19, 2014. ^ Wire-Datastream, •. "Twins swept out of playoffs a year ago, leaving bitter taste". PostBulletin.com. Retrieved September 17, 2018. ^ "Delivery Man of the Month/Year Award by DHL on Baseball Almanac". Baseball-Almanac. Retrieved May 19, 2014. ^ Thesier, Kelly (October 29, 2007). "Closed deal keeps Nathan with Twins". MLB.com. Archived from the original on December 7, 2013. Retrieved May 19, 2014. ^ "After 37 saves in 2007, Nathan agrees to new four-year contract with Twins". ESPN.com. Associated Press. March 24, 2008. Retrieved February 26, 2009. ^ "MLB.com: Gameday". MLB.com. May 27, 2008. ^ Thesier, Kelly (July 6, 2008). "Mauer earns first All-Star Game start". MLB.com. Archived from the original on November 11, 2013. Retrieved May 19, 2014. ^ "Joe Nathan Stats, News, Photos – Minnesota Twins". ESPN. Archived from the original on May 8, 2008. ^ "MLB Closer Report". ESPN.com. Retrieved May 19, 2014. ^ "Indians top Twins 12–9 in 11 innings". Yahoo! Sports!. Associated Press. September 17, 2008. Retrieved May 19, 2014. ^ "MLB Baseball Pitching Statistics and League Leaders". ESPN.com. Archived from the original on December 8, 2013. ^ Caple, Jim (October 11, 2009). "A baseball era ends in Minnesota". ESPN.com. Retrieved May 19, 2014. ^ Thesier, Kelly (March 21, 2010). "Nathan to have Tommy John surgery". MLB.com. Retrieved March 21, 2010. ^ "Joe Nathan empties his dirtbag to get his first save at Target Field". TwinCities.com. Retrieved April 23, 2015. ^ "Joe Nathan replaced by Capps as Twins' closer". San Francisco Chronicle. Associated Press. April 18, 2011. Retrieved May 29, 2011. ^ La Velle, E. Neal III (May 29, 2011). "Nathan is latest Twins reliever to disabled list". Minneapolis Star-Tribune. Retrieved May 29, 2011. ^ "TWINS: Nathan new saves king of Minnesota closers". Retrieved September 17, 2018. ^ a b Bollinger, Rhett (November 21, 2011). "Nathan's tenure with Twins officially ends". MLB.com. Retrieved November 22, 2011. ^ "Minnesota Twins Top 10 Career Pitching Leaders | Baseball-Reference.com". Baseball-Reference.com. Retrieved September 17, 2018. ^ Sullivan, T. R. (November 21, 2011). "Nathan agrees to two-year deal with Texas". MLB.com. Retrieved November 22, 2011. ^ D. J. Short (November 21, 2011). "Rangers ink Joe Nathan to two-year contract, moving Neftali Feliz to rotation". Hardball Talk. Retrieved May 13, 2014. ^ a b "Joe Nathan Stats | Baseball-Reference.com". Baseball-Reference.com. Retrieved January 27, 2017. ^ Lacques, Gabe (April 9, 2013). "Ump's blown call enables Joe Nathan to notch 300th save". usatoday.com. Retrieved January 12, 2014. ^ Beck, Jason (December 4, 2013). "Tigers, Nathan announce two-year pact". MLB.com. Archived from the original on December 11, 2013. Retrieved December 4, 2013. ^ Czech, Adam (September 16, 2014). "TigersTwins stun Tigers in 9th for 4–3 win". CBSsports.com. Retrieved September 17, 2014. ^ Schmehl, James (April 22, 2015). "Detroit Tigers closer Joe Nathan scared, frustrated after latest setback: 'It feels like I broke my arm'". MLive.com. Retrieved April 23, 2015. ^ Jahnke, James; Fenech, Anthony (April 23, 2015). "Detroit Tigers' Joe Nathan out for season with arm injury". Detroit Free Press. Retrieved April 23, 2015. ^ Beck, Jason (April 23, 2015). "Nathan to have season-ending Tommy John surgery". MLB.com. Retrieved April 23, 2015. ^ Fenech, Anthony. "Nathan out for 2015, but not planning to retire yet". Detroit Free Press. Retrieved April 23, 2015. ^ Beck, Jason (November 3, 2015). "Tigers decline Nathan's option". MLB.com. Retrieved November 3, 2015. ^ Gonzales, Mark. "Cubs sign Joe Nathan". Chicago Turbine. Retrieved May 17, 2016. ^ Rogers, Jesse (August 6, 2016). "Cubs' Jorge Soler returns to lineup; reliever Joe Nathan DFA'd". abc7chicago.com. Retrieved August 16, 2016. ^ "Giants' Joe Nathan: Signing minor-leaugue deal with Giants". CBS Sports. August 16, 2016. Retrieved August 16, 2016. ^ "San Francisco Giants: Joe Nathan Comes Full Circle". FOX Sports. September 4, 2016. Retrieved September 17, 2018. ^ Janes, Chelsea (January 31, 2017). "Nationals sign righties Joe Nathan and Matt Albers to minor league deals". Washington Post. Retrieved January 31, 2017. ^ Reddington, Patrick (March 27, 2017). "Washington Nationals announce Joe Nathan and Matt Albers have been unconditionally released". Federal Baseball. Retrieved March 27, 2017. ^ Janes, Chelsea (April 9, 2017). "Nationals bring back veteran reliever Joe Nathan on minor league deal" – via www.washingtonpost.com. ^ Todd, Jeff (May 31, 2017). "Nationals Release Joe Nathan". mlbtraderumors.com. Retrieved May 31, 2017. 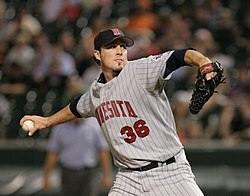 ^ a b c "Joe Nathan officially retires with Twins". MLB.com. Retrieved September 17, 2018. ^ "Sortable Player Stats (MLB)". MLB.com. ^ "Sortable Player Stats (AL)". MLB.com. ^ a b c d "For single seasons, From 1914 to 2014, Total (within Season Totals), (requiring earned_run_avg≤1.88, IP_from_outs≥60, whip≤.999 and SV≥35), sorted by greatest Earned Run Average for this split". Sports Reference LLC. May 6, 2014. Retrieved May 19, 2014. ^ a b c d "Minnesota Twins Top 10 Pitching Leaders". Baseball-Reference.com. Retrieved May 19, 2014. ^ "Longest Streak with A.S=1 From 1914 to 2014, Playing in the AL, In Save Opportunities". Sports Reference LLC. Retrieved May 19, 2014. ^ "PITCHf/x Player Card: Joe Nathan". Brooks Baseball. Retrieved July 10, 2012. Wikimedia Commons has media related to Joe Nathan.